The KSE-100 machine works on the air lifting of empty capsules. The capsules are stored in the capsule hopper of the machine. As and when the level of the capsules in the capsule filling machine [CFM] hopper falls below a predetermined level, the machine starts loading the empty capsules to the CFM hopper and stops when the set level is reached. The capsules are delivered from the hopper to the feeding tray, from where they move forward on to the sorting plate. The forward movement of the capsules is due to the vibratory motion of the feeding tray. 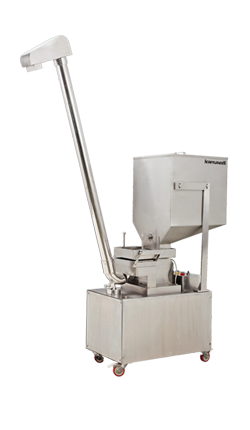 The flow of capsules from the feeding tray to the sorting plate can be regulated with the help of gate mounted on the hopper. The capsules are sorted in the sorting section before they are conveyed to the CFM. The sensing of capsule level in the CFM is done with the help two sensors mounted on the CFM hopper. One is for low level sensing and the other is for high level sensing. The air stream required for lifting the capsules is developed by an air blower.